Two light-coloured wooden boats of simple construction, moored in the river: this is perhaps the best way of describing D. Chipperfield's River & Rowing Museum, consisting of two bleached wooden sheds that look like the traditional wooden barns and house-boats of Oxfordshire. The effect of "elevation" above the ground is reminiscent of the Japanese temples so dear to the architect for their qualities of light weight and elegant construction. In organisational terms, the ground floor hosts the museum's "public" and welcoming functions, while the upper floor is entirely dedicated to exhibition space; the walls have thin sections in which the wooden division is strengthened by steel uprights, invisible from the outside. Its site and function make the River & Rowing Museum somewhat reminiscent of London's New Tate Gallery competition, in which Chipperfield presented a minimal project: he divested the museum of its nineteenth-century air of sacredness and nostalgia, poised between temple and monument, suggesting an "antimuseum", a sort of window opening onto the view of the Thames. 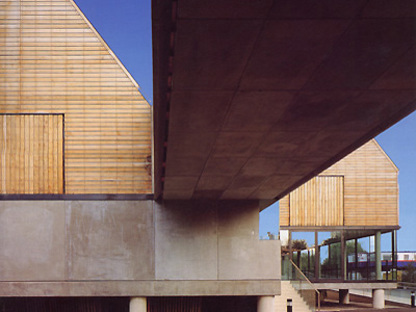 Chipperfield's work in Henley, simple yet refined and fitting perfectly into its context, won him the 1999 RIBA Award. His project won the award because: "This complex building leaves behind an impression of simplicity. Interior and exterior spaces are very clearly articulated. The museum perfectly conveys the sense of tranquillity in the river landscape, giving one the impression that it has always been there, with a pregnant, not passive presence".